At least 30 Ukrainian naval personnel have left the Ukrainian Navy headquarters in the city of Sevastopol on the Crimean Peninsula after demonstrators stormed the premises early in the morning. 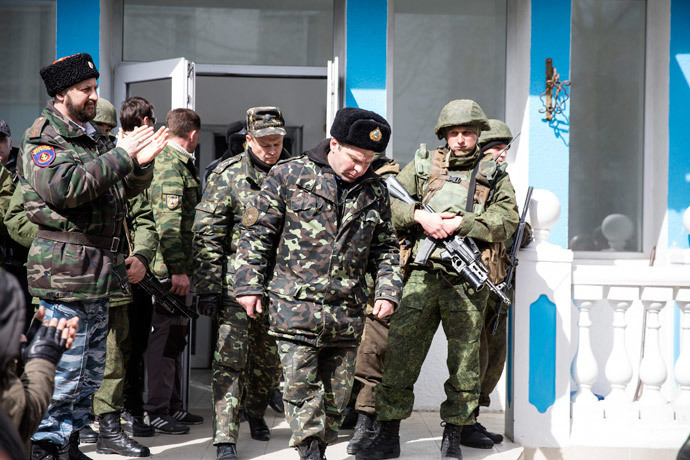 Crimean self-defense troops have made a passage to let Ukrainian servicemen leave the territory of the HQ. Reports on the number of people to have left vary with ITAR-TASS saying around 50 personnel are gone, Rear Admiral Sergey Gaiduk of the Ukrainian Navy among them. However, Kryminform says Gaiduk has been detained by the Sevastopol prosecutor’s office while RIA Novosti reports that his whereabouts is unknown. People began protesting outside the HQ at 08:00 GMT. Several thousand participants cut fences, stormed inside and changed the flags on the flagpoles. Some of the participants of the rally were singing the Russian national anthem. 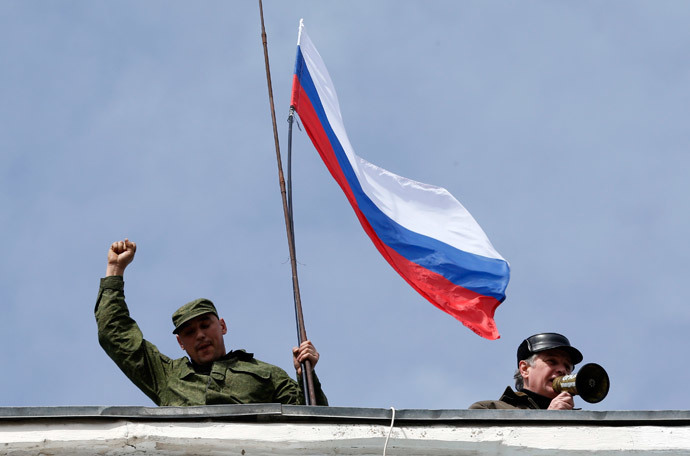 The protesters hoisted Russian and St. Andrew’s flags, the latter being the Russian Navy Ensign, according to Interfax. There was an immediate alert on the territory of the HQ and the Ukrainian seamen lined up in front of the protesters, reports Interfax. The line was broken by cars belonging to activists that entered the territory. 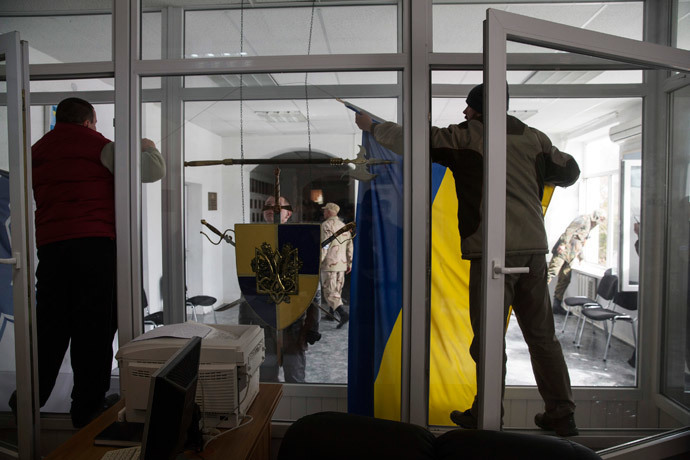 The protesters were calling upon the Ukrainian servicemen to leave the HQ. An ambulance was also called as a precaution. UkrStream.TV cameras which recorded the situation near the headquarters of the Ukrainian Navy show no violence on the precinct. After the protesters entered the navy HQ territory, they began holding talks with the representatives of the Ukrainian Navy. According to Sevastopol news websites, the Commander of the Russia’s Black Sea Fleet, Vice-Admiral Aleksandr Vitko, later arrived to negotiate with Gaiduk. After just 15 minutes of negotiations, Vitko left the grounds and refused to comment on the results of the talks with Gaiduk. Before leaving, both rear admirals held talks with Admiral Yury Ilyin, the new Army chief and Admiral Viktor Maksimov, the head of Ukraine’s Naval Forces. Earlier, there were reports of possible provocations. Some unidentified men tried to enter the building. However, the attempts failed due to Self-Defense Unit guards and Crimean Cossacks. Ukrainian armed forces commander Mikhail Kucin has informed his Russian counterpart Valery Gerasimov that he has authorized the use of military force by troops stationed in Crimea, according to Ukraine’s Defense Ministry. In a phone conversation with Gerasimov, Kucin has emphasized de-escalation and a political solution to the crisis, rather than a violent one. The green light to use force has been given by him in the aftermath of the events in Simferopol, which have led to the death of one Ukrainian soldier and another from the Crimean Self-Defense Forces, while two others were injured. 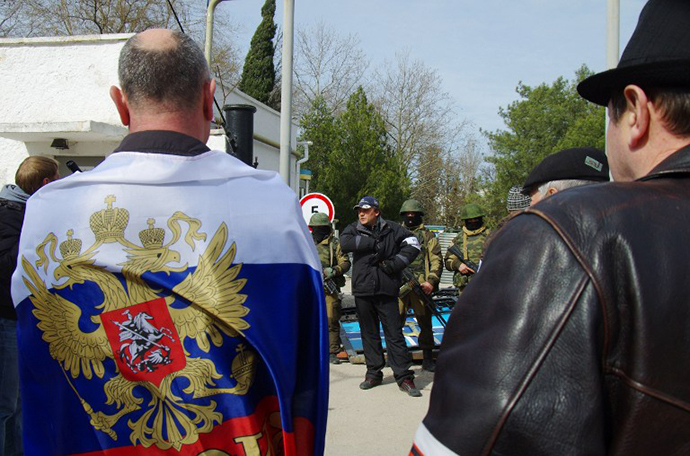 On March 16, Crimea held a referendum in which over 96 percent of its citizens voted to join Russia. Two days later, the Autonomous Republic of Crimea and Sevastopol, a city with a special status, became federal objects of the Russian Federation. Do I have a workers’ compensation case in California?